John G. Hartzell was born on March 12, 1812 in Somerset County, PA and is believed -- although not entirely proven -- to have been the son of George and Mary (Younkin) Hartzell. Some family stories suggest that John came to America from Germany when about the age of five. But census records and other documents suggest he was birthed in Pennsylvania. In 1990, nearly a century after his death, a great-great-granddaughter told his story in a booklet entitled Ancestors and Descendants of James Vincent Hartzell (1872-1924). John grew up speaking German, which may have led to the assumption that he was born in the fatherland. As an adult, he stood 5 feet, 10½ inches tall, with a dark complexion, brown eyes and dark hair. He married Mary Henry (1812- ? ). Their known children who lived to adulthood were Adaline Fuller, William Wallace Hartzell, Catherine Hartzell, Sarah Jane Chaddock Brantner, Mary Elizabeth "Lizzie" Kenney and John Francis "Frank" Hartzell. They had these other children: George Hartzell who died in August 1854 in Marshall County at the age of one month; and twins Margaret and Ann Hartzell who died of fever in the summer of 1853, both less than a month old. In about 1842, when John and Mary both were about age 30, they made the decision to migrate away from their family into the northern panhandle of Virginia, settling in Marshall County (later becoming West Virginia). They selected a farm in or around the village of Loudenville, halfway between Cameron and Glen Easton. Marlyn (Hartzell) Dalsimer notes in her writings that John "must have worked as a day laborer on neighboring farms, as he accumulated no property." The reasoning behind their move westward is not yet known. One story, told by John's daughter Kate, is that circa 1840-1843, John got into a fight, struck a man and, believing the man to be dead, fled out of state with his family. But this is only conjecture for now. The 1850 federal census shows the family living in the county's 33rd District. John must have found ways to communicate with his family back in Somerset County, as evidenced by the fact that several other sets of relatives moved in the 1850s to the Marshall County, VA/Greene County, PA region. Among them were John's uncle and aunt, George and Nancy (Johnson) Younken and John's first cousins Henry and Polly (Younkin) Minerd. Later, during the 1850s, John's mother also moved to Aleppo, Greene County. The 1860 census shows their post office to be Rock Lick, Marshall County. More than three years after the Civil War erupted, on Sept. 4, 1864, the 52-year-old John traveled to Wheeling to join the Union Army. To do so, he received a $320 bounty to cover one year of service, with this fact recorded in Scott Powell's 1925 book, History of Marshall County, W.Va. He lied about his age, giving it as 43, and enlisted at Wheeling, VA. He was assigned to the 17th West Virginia Infantry, commanded by Charles H. Day. ...he was out on a scout at the time, it was at night, dark and was crossing a stream called Big Run on a foot log and finding that he was going to fall jumped and ruptured himself ... And on returning from this scout he first felt the rheumatism in both of his knees. It grew gradually worse and on the 20th day of May 1865 we lay in an [illegible] stable at Clarksburg, a heavy rain coming up. I got thoroughly wet and my left leg commenced swelling each way from the knee, disabling me entirely for duty. John never received formal medical treatment for his injury. He did receive some medication for the rheumatism from Dr. James Ramsey but had to wear a truss ever after. He was honorably discharged on June 30, 1865. Sadly, Mary appears to have died during the decade of the 1860s. Her story has faded away into the mist of forgotten history. Census records for 1870 indicate that John's home was in the Cameron District of Marshall County, with him laboring as a shoemaker. that year, his daughter Catherine and Jane, and son Francis, lived under their roof. In 1880, now in the Webster District of Marshall County, John was marked in the census as a farmer, with his daughter Kate and grandsons George and Thomas in the household. He enjoyed teaching youngsters about how to identify and use herbs and roots as medicines. John died in Loudenville at the age of 79 on Oct. 2, 1891. Interment was in Beeler Station Christian Church Cemetery, along what today is West Virginia Route 250, a few miles from Cameron. Death records kept by Marshall County listed his nationality as "German." A standard-issue military grave marker was erected at his final resting place. John's grave marker was photographed by the founder of this website in September 2015. It shows signs of damage due to grass cutting, but otherwise is fairly legible. Daughter Adaline Hartzell (1836-1893) was born in 1836 in Somerset County. Sometime in the mid-1850s, she married George W. Fuller (1835- ? ), a native of West Virginia. They had three known children -- Catherine Caldwell, John Fuller, James Fuller and Elmer Ellsworth Fuller. The family lived in Virginia (later part of West Virginia) in 1857 when their eldest daughter war born. By 1859, they had moved across the Pennsylvania state line into Greene County's Richhill Township, where their son John was born. George is said to have served in the Civil War, and his service is being researched. It's possible he is the same "George W. Fuller" who was a member of the 12th West Virginia Volunteer Infantry, Company B. After the war, the Fullers resided in Marshall County, where their youngest son was born in 1868. In 1886, Adaline wrote that she had "nursed and attended" her father for rheumatism for nearly 20 years, starting in 1865. She added that "He has not been able to perform any manual labor for the last 22 or 23 years and is now in the same condition with no prospects of a change for the better." Research suggests that she died on Aug. 20 or 21, 1893, at the age of 57. Her final resting place is not known. Daughter Catherine Fuller (1857- ? ) was born on Oct. 4, 1857 in Virginia (which later became part of West Virginia) or in Aleppo, Greene County. She married (?) Caldwell. When she was in her late 70s, she resided in Washington at 19 Buena Vista. At age 78, suffering from congestive heart failure, she died at home. Burial was in Mt. Zion Cemetery, with Alice Phillip of Washington providing details for the death certificate. Son John ("Ellis"?) Fuller (1859- ? ) was born in 1859 in Pennsylvania. Son James Fuller (1868- ? ) was born in 1868 in West Virginia. Son Elmer Ellsworth Fuller (1871-1934) was born on Aug. 18, 1871 in West Virginia. He married Martha ( ? - ? ). They made their home in West Washington at 403 Addison Street, and he worked as a retail grocery operator. He was burdened with heart disease and died a day after his 63rd birthday on Aug. 19, 1934. Interment was in Washington Cemetery. L.H. Fuller gave information for the Pennsylvania certificate of death. Son William Wallace Hartzell (1838-1915) was born in 1838 in Somerset County. At the age of 22, in 1860, unmarried, he lived with his parents and earned income as a laborer. Then on Nov. 14, 1867, as he neared his 30th birthday, he married 18-year-old Rebecca Murray (1849-1884). The bride was a dozen years younger than the groom. Rebecca is said to have had beautiful red or auburn-colored hair and may have been of Scottish heritage. They went on to have 10 children -- Mary Reana "Irene" Layton, Charles Monroe Hartzell, James Vincent Hartzell, Ida Jane Hartzell, William "Franklin" Hartzell, Wylie Dexter Hartzell, Wilmetta Hartzell, Robert Hartzell and Ada Hartzell. Federal census records of 1870 show the family living in the Cameron District of Marshall County, earning income as a farmer. Then, by 1880, they had relocated into the Washington District. Moving again, the family dwelled in the mid 1880s in the First Ward of Moundsville. Tragically, the Grim Reaper of Death carried away the mother of these children in a terrible February 1884 flood. As chronicled in a history by Marlyn (Hartzell) Dalsimer, Rebecca recently had given birth and was still weak when the Ohio River spilled its banks during what must have been unusually warm weather for the dead of winter. As the waters rose dangerously higher, she and her newborn were carried out of the house just 15 minutes before the structure collapsed. In covering the event, the Moundsville Reporter (Feb. 15, 1884) said that "Mrs. Hartzell of the First Ward died Saturday and was buried Monday. the excitement and exposure of being removed from the flood hastened her death." The baby, cared for by elder sister Mary Roena, also is thought to have died some period later. Rebecca and the baby are believed to rest for eternity in Moundsville's First Street Cemetery, later to be paved over for a sidewalk. William, now widowed, was described by a granddaughter as a "harem-scarem type." He apparently could or would not keep his family of children together after such a tragedy, and they split up. Son Charles went out on his own at age 13; son James was taken in by his Hartzell grandparents in Loudenville; and son Wylie was brought into the household of the family of Dorsey. After five years in widowerhood, 51-year-old William married again, to 21-year-old Delilah Duncan (1878- ? ) of Greene County. The wedding ceremony was held on June 20, 1889, in Cameron, with Rev. W.W. Roberts officiating. (Roberts also oversaw the January 1900 wedding of one of William's distant cousins, Harry Orlan Miner, to Armena Viancy Cain of Hundred, Wetzel County, WV.) The marriage lasted for 26 years until the separation of death. Suffering from an incurable case of kidney problems ("Bright's Disease"), William died in his son Charles' home on Center Street in Moundsville on May 7, 1915. (This is not recorded in any records in Marshall County.) In an obituary, the Moundsville Daily Echo said he "was 75 years old, and had spent most of his life in this city and was a well known resident throughout Marshall county." Following a funeral service in the son's home, officiated by Rev. C.C. Lanham, burial was in Mt. Rose Cemetery in Moundsville. For the family, the location of the burial was lost. Granddaughter Opal (Hartzell) Doty recalled that it was in a Moundsville cemetery, "close to the driveway after the first turn in the road near where the caretaker's house is now, coming off of Jefferson Ave."
Daughter Mary Reana ("Rowena" or "Irene") Hartzell (1868- ? ) was born in August 1868 in West Virginia. In about 1886, at the age of 18, she was united in matrimony with 28-year-old Arthur D. Layton (1857- ? ). They had one child, a daughter, identity unknown. Circa 1900, they made their home on Bradshaw Street in Indianapolis, Marion County, IN, with Arthur employed as a traveling salesman peddling notions. By 1920, Arthur's occupation was listed by the census-taker as commercial salesman. When the federal census was taken in 1920, they lived on Regent Street in Indianapolis and their 12-year-old granddaughter Goldy Willard resided under their roof. One of their descendants, Vidella Mears, lived in Mississauga, Ontario, Canada in the 1960s. Son Charles Monroe Hartzell (1871-1957) was born on Feb. 17, 1871. He was age 13 when his mother died. Either by choice or by force, he decided to go "off on his own, working at occasional jobs for neighboring farmers, often sleeping in hay mows," wrote Marilyn (Hartzell) Dalsimer. Years later, when the City of Moundsville proposed to pave a sidewalk along First Street Cemetery, thus obliterating his mother's grave, Charles was asked if he wanted the grave to be moved, but he declined "after that long a time" had passed. He married Cora Alice Games (1878-1943), daughter of David and Mary Jane (Auten) Games. Their nuptials took place no April 8, 1895 in Moundsville by the hand of Rev. Charles Z. Rader. They dwelled in rural Moundsville and had three known children -- Marie Hartzel, Opal Doty and Ralph Hartzell. 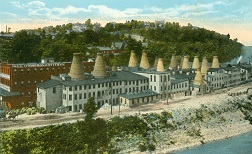 Circa 1910, the family lived in Moundsville Ward 1, with Charles employed as a glass factory packer. Stricken with pancreatic cancer at the age of 65, Cora Alice died on May 2, 1943. She was entombed in Mt. Rose Cemetery in Moundsville. Charles is said to have died on June 12, 1957. Son James Vincent Hartzell (1872-1924) was born on June 1, 1872 in or near Moundsville. After his mother died when James was 12, he went to live with his maternal grandfather John G. Hartzell in Loudenville. At the age of 22, on July 14, 1894, James married 17-year-old Tillie M. McGary (1878- ? ), daughter by Elijah and Dora Eliza (Carr) McGarry of Loudenville. Because Tillie legally was too young to marry, her mother had to sign her consent. The marriage ceremony was conducted by Rev. S.L. Brister and held at Pleasant Valley near Cameron. They dwelled in Loudenville in the late 1890s. The Hartzells had 10 children, born in seven different places -- Ethel Mae "Doe" Murphy, Esta Jane "Nannie" Stinard, Sidney Wilmetta "Met" Belon, James "Encil" Hartzell, John Carlton Hartzell, Gladys Virginia Hennebart, Raymond Vincent "Pete" Hartzell, Lawrence Leo "Ned" Hartzell, Rowland Sunday Hartzell and Martha Lois Clarke Langford. They also helped raise a foster daughter, Lucy Velma (Brake) Stinard, daughter of Virginia P. "Beebee" Brake whom the children considered as their foster mother. Sadness covered the family on July 15, 1898 when their baby son Encil, age six months, died of unknown causes. A record of Encil's passing is on file in Marshall County records. Several of their other children survived attacks of diphtheria. He also was a bricklayer and is said to have helped pave the dirt road between Loudenville and Cameron. The couple decided to migrate and between the years 1903 and 1907 moved to Hopedale in Green Township, Harrison County, OH. They are shown in Green Township on the 1910 census, with James working as a tenant farmer, apparently on shares on the "Arnold place." By 1919, the family had moved again to a farm in Dillonvale in Smithfield Township near Steubenville, Jefferson County, OH. During this period of time, the Hartzell children attended school in the valley between Dry Fork and Piney Fork. At the age of 51, suffering from liver problems caused by cirrhosis, James died at home in Smithfield Township on June 14, 1924. Interment was in Mount Pleasant Cemetery. Tillie outlived her husband by many decades and supported herself through employment at Ohio Valley Hospital. During World War II, she received the heart-breaking news of the death of her grandson Tony James Belon while in service with the U.S. Armed Forces in the Pacific Theatre. In 1971, celebrating her 93rd birthday, she was profiled and pictured in the Harrison News-Herald of Cadiz, OH, standing beside a decorated family tree with the names of 150 of her offspring. A granddaughter, Marlyn (Hartzell) Dalsimer, later known as Marlyn Klee-Hartzell, compiled an impressive genealogical record published in 1990, entitled Ancestors and Descendants of James Vincent Hartzell (1872-1924) - Matilda Mae McGary (1878-1971) - Virginia Pearl Brake (1883-1970). Granddaughter Ethel Mae "Doe" Hartzell (1894-1992) was born on Oct. 15, 1894 in Marshall County. She married Thomas Murphy ( ? - ? ). In 1914, the couple relocated to Leetonia/Salem, Columbiana County, OH. They produced six children -- George Thomas Murphy, James Murphy, Agnes Gorman Toot, Phemie Crumbaker, Jessie Metz and Annabelle Brain. Sadly, they endured the untimely deaths of their 30-year-old coal miner son George on Oct. 10, 1944, after his automobile was rammed by a railroad train; daughter Agnes in 1969 and son James in 1985. Ethel earned a living over the years as a practical nurse. She was interested in family history and inspired her niece Marlyn Klee-Hartzell to research and print her findings. Spending her final years in the home of her daughter Phemie Crumbaker in Salem, she died there at the age of 97 on Sept. 25, 1992. Interment was in Washingtonville Cemetery following funeral services officiated by Pendle Roth. Obituaries published in the Steubenville (OH) Herald Star and the Leetonia area newspaper noted that she was survived by 16 grandchildren, 44 great-grandchildren and 11 great-great grandchildren. Granddaughter Gladys Virginia Hartzell was united in wedlock with (?) Hennebart. In he early 1990s, she resided in Martins Ferry, Belmont County, OH. Grandson Raymond Vincent "Pete" Hartzell lived in Steubenville, Jefferson County, OH in 1992. 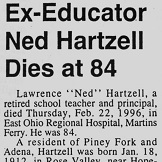 Grandson Lawrence Leo "Ned" Hartzell (1912-1996) was born on Jan. 18, 1912 in Rose Valley near Hopedale, Harrison County, OH. He married Lillian Mae Klee (1920-1966), daughter of Lewis and Maude (Tubaugh) Klee of Bellaire, OH. They produced five children -- Larry Hartzell, Marlyn Dalsimer (a.k.a. Marlyn Klee Hartzell), Marie Hartzell Billiter, Nedra Hartzell and Susan Hartzell. Ned pursued a career as an educator. For 35 years, he taught in and was principal of schools in the Jeffeson County communities of Pine Grove, Piney Fork and Adena. To supplement his income, he learned the trade of carpentry and constructed more than 50 homes in eastern Ohio in addition to related work for Bedway Coal Company of Adena. They were members of the Piney Fork Presbyterian Church, with Ned joining the Masons lodge of Adena and Lillian belonging to the Presbyterian Women's group. 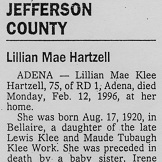 Lillian died at home in Adena at the age of 75 on Feb. 12, 1996. Funeral services were held in the family church, followed by interment in Highland Cemetery in Mount Pleasant, OH. Obituaries were printed in the Steubenville Star and Martins Ferry Times-Leader. Ned only survived his wife by 10 days. At the age of 84, he joined her in eternity on Feb. 22, 1996 in East Ohio Regional Hospital in Martins Ferry. Grandson Rowland Sunday Hartzell ( ? - ? ) dwelled in 1992 in Gibsonia, Allegheny County, PA.
Granddaughter Martha Lois Clarke Hartzell wed (?) Langford. Her home in 1992 was in Weirton, Hancock County, WV. Foster granddaughter Lucy Velma Brake ( ? - ? ) married (?) Stinard. Her home in the early 1990s was in Smithfield, Jefferson County, OH. Daughter Ida Jane Hartzell (-1874-) was born on April 24, 1874 in Washington Township, Marshall County. At the age of three months, 18 days, she died after contracting cholera. Her death is recorded in Marshall County records. Son William Franklin "Frank" Hartzell (1875-1942) was born on Aug. 25 or 28, 1875 in Glendale near Moundsville. On Nov. 1, 1899, the 22-year-old Frank married 17-year-old Ida May Harding (1884- ? ), daughter of Burris and Mary Ann (Merinar) Harding (or "Harden"). Rev. W.B. King officiated. Their five known children included Albert Hartzell, Walter Leroy Hartzell, Virginia Hartzel, Clarence Hartzel and one other. Circa 1910, Frank and family lived on Linden Street in Moundsville, and he earned sporadic income performing odd jobs. Eventually, he became a plumber in the Moundsville community. They made their home in the early 1940s at 303 Ninth Street in Moundsville. Frank suffered a heart attack and was found dead in bed at age 66 on April 3, 1942. Interment was in Moundsville's Fairview Cemetery. Ida May survived for seven years and spent her final years at 7 Linden Avenue in Moundsville. She died of a stroke at age 65 on May 29, 1949, with burial in Greenlawn Cemetery. Their son Albert never married and worked in the glass industry in Moundsville. Their son Walter married Lorraine Cordelia Mellon and was a longtime electrician in Moundsville. Son Wylie Dexter Hartzel (1880-1959) was born on Aug. 8 or 9, 1880. He was four years old when his mother died, and he was taken into the home of the Dorsey family and raised to manhood there. When he was age 26 and she 23, Wylie married C. Blanche Magers (1883-1929), daughter of Lank and Anna (Rush) Mangers. The nuptials were celebrated on March 2, 1907 at the residence of Rev. W.D. Reed of the Methodist Church. Blanche apparently had been married before and brought a daughter, Elsie, to the marriage. Wylie and Blanche went on to produce at least two children of their own -- William H. Hartzell and Margaret Hollie. In 1910, the federal census shows the family dwelling in Moundsville's Washington District, with Wylie laboring at a local brickyard. In the 1920s, they lived in Moundsville at 204 Pine Avenue at the corner of Second Street. Sadly, suffering from syphilis which led to an abscess of the brain, Blanche died at age 45 on Jan. 31, 1929. He remains were placed at rest in Moundsville's Fairview Cemetery. Wylie lived for another three decades, and obtained work as a laborer at a zink smelter. At the age of 78, suffering from heart and kidney disease, he died in Reynolds Memorial Hospital on June 15, 1959. Interment was in Moundsville's Fairview Cemetery. Moundsville, looking east from the tower of the First Methodist Episcopal Church. Daughter Catherine "Kate" Hartzell (1841-1931) was born on April 13, 1841 (or 1838) in Somerset County. She never married. Evidence suggests that she bore two sons out of wedlock -- George (in 1863) and Thomas (1868). She was age 38 in 1880 and resided with her sons under her father's roof in the Webster District of Marshall County. Her address in the 1930s was in Loudenville, Marshall County. She was a beloved aunt to some of her nephews and nieces, and was "the source for much of the information which Ethel [Hartzell Murphy] compiled on the family," wrote Marlyn Hartzell Dalsimer. She also is said to have had long hair "which never really turned gray" and which was combed by her niece Ethel. Another niece, Daisy (Kenny) Felger, came to live under Kate's roof and nursed her until death. In 1915, at the death of her brother Wallace, she was named in the Moundsville Daily Echo obituary. Burdened with cancer of the face, Kate died at the age of 93 on Dec. 11, 1931. Burial was in Beeler Station Cemetery, with her son G.W. of Cameron providing details for the death certificate. No stone marks her final resting place. After her passing, her niece Daisy inherited the little house in Loudenville and "fixed it up." Son George Washington Smith Hartzell (1863-1944) was born on Oct. 17, 1863 in Marshall County. His parents were not married to each other. He apparently never married and was a longtime merchant in the Loudenville section of Cameron. When the federal census was taken in 1940, he lived in Loudenville with his cousin Daisy and her husband Fred Felgar boarding in his home. At age 81, he was struck down by an embolism and was paralyzed, leading to death three days later on Nov. 5, 1944. Interment was in Beeler Station Cemetery, with Mrs. Fred Felgar of Cameron providing details for the death certificate. Son Thomas Polen Hartzell (1868- ? ) was born in 1868. His parents were not married to each other. At the age of 12, he lived with his mother, brother and grandfather in the Webster District of Marshall County. He is said to have died young. Daughter Sarah Jane Hartzell (1843-1882) was born in 1843 in Marshall County, VA. She was married twice. Her first husband was (?) Chaddock. They had one known daughter, Minnie Chaddock Brantner. Later, she was united in wedlock with Joseph N. Brantner (1834- ? ), sometimes spelled "Brantnor." They were a dozen years apart in age and in 1880 made their home in Moundsville, where Joseph earned a living as a laborer. The Brantners went on to have two more offspring, Ida May Brantner and Kate Brantner. Sarah Jane is reputed to have died in her father's home in Loudenville in February 1882, after which time the daughters were taken in by others to raise. Daughter Minnesota "Minnie" Chaddock (1868- ? ) was born in about 1868. As a girl living in Moundsville, she was adopted by her step-father and took his surname of "Brantner." Daughter Ida "May" Brantner (1877- ? ) was born on Aug. 8, 1877 in Marshall County. Her childhood seems to have been one of turmoil and frequent movement to new homes supervised by different adults. In 1954, writing to cousin Ethel (Hartzell) Murphy, in a letter quoted in Marlyn (Hartzell) Dalsimer's history, she said: "When I was about eight years old I went and lived with Jacob and Isabel McConnell in Moundsville. I was there about one and one-half years. Then I went to live with Margaret Applegate about twelve miles east of Wellsburg, W.Va. on the Washington Pike. I was with them until 1901 when the family broke up and I went to John V. Rodgers on Wheeling Island, where I stayed until I was married." At the age of 23, on June 8, 1902, she was wedded to William Alvia Malson at Triadelphia near Wheeling, Ohio County, WV. They migrated to Michigan, where their son John Rodgers Malson was born in October 1907. Daughter Mary Elizabeth "Lizzie" Hartzell (1848- ? ) was born in about 1848 in Marshall County, VA. In 1867, at the age of 19, she married 27-year-old Thomas Kenney (1840- ? ), an immigrant from Ireland. Thomas was a skilled stone cutter and found employment in the bustling industrial town of Dunbar, PA in the coal and coke region of the Laurel Mountains, where Lizzie's grandparents had lived in the 1840s. They had six known children -- Amanda Catherine Leasure, Edward Kenney, Mary Kenney, Elizabeth Daisy "Lizzie" Felger, Eleanor (or " Ella" or "Helen") Gearhart and May Bell Kenney. Thomas and Lizzie relocated to Dunbar and were residing there in 1870 when the federal census was taken. By 1880, they had moved to near Perryopolis in Perry Township, Fayette County. Nothing more is known. Years later, their family history information was compiled by Ethel (Hartzell) Murphy. Daughter Amanda Catherine "Mandy" Kenney (1868-1944) was born on Oct. 17, 1868 in Loudenville, Marshall County. A newspaper once said that "She spent practically all of her life at Alverton," Westmoreland County, PA. On Valentine's Day 1889, when she would have been 20 years of age, Amanda married 32-year-old William H. "Bill" Leasure (1857-1912), son of Silvis and Annie (Adams) Leasure. The service was officiated at Stonerville by Rev. L.R. Jones. Amanda was a decade younger than her husband, and how they would have met is a mystery. William had been married before to Jane Ream and brought three sons to the marriage -- Henry Leasure, Elyet Ream ("Elliott") Leasure and Harvey Leasure. By 1891, the couple had relocated to the Stonerville/Alverton community on the outskirts of Mount Pleasant, the first of her family to reside in the Laurel Mountains since her great-grandparents left there in about 1843. They went on to produce four more offspring of their own -- Lottie Bradley Hull, Torrance Leasure, Hazel McKissock and Chester Arthur Leasure. The federal census of 1900 shows the Leasures making their residence in Stoners, where William was working as a coal miner. That year, William Murray and Charley Thomas boarded in their home. By 1910, living on Mill Street in Stonerville (also known as "Stoners"), William was a stable boss at the local coke works and son Torrance, age 18, was a "second rougher" in a sheet steel mill. Dwelling under their roof in 1910 was nine-year-old nephew James Sanders. Sadly, William died on May 24, 1912 at the age of 55 due to heart valve failure. Interment was in Alverton Cemetery. Amanda supported herself as a 45-year-old widow in 1920 by working as a servant in the Stoners household of coal miner Edward Long. Amanda and several of her children attended the first annual Leasure family reunion in Sept. 14, 1929. An article about the event, in the Connellsville Daily Courier, reported that it was held at Taits Grove. Among the attendees were Mr. and Mrs. Stewart Shotts and family of Alverton, Mr. and Mrs. Elliott Leasure of Scottdale, Mr. and Mrs. Gilmore Wolfe of Scottdale, Mr. and Mrs. Weitzel of Ruffsdale, Mr. and Mrs. Torrance Leasure, Mr. and Mrs. Chester Leasure of Connellsville, Mr. and Mrs. Thomas Felgar of Monessen, Arthur Leasure and Evelyn Leasure and Anna Fern Leasure of Ohio, Mr. and Mrs. James Chadderton and family of Greensburg, Mr. and Mrs. Burrel Shields and family of Greensburg, Mr. and Mrs. George Sanders and son James of Greensburg, and Eleanor, Garnet Hilda, Amy Catherine and T.H. Cunnard of Tarr, Westmoreland County. In 1944, Amanda resided at 1119 Sampson Street in Connellsville. Suffering from heart and kidney failure, she died at home on Oct. 26, 1944, just nine days after her 76th birthday. She was laid to rest in Alverton Cemetery. The Daily Courier noted her survivors as 32 grandchildren and 32 great-grandchildren. Step-grandson Elyet Ream ("Elliott") Leasure (1877-1961) was born in 1877 in Kittanning, Armstrong County, PA. He married Anna Crabtree ( ? -1958) and lived in Scottdale, Fayette County, PA. The couple produced two children -- Sylvus P. Leasure and Goldanna Wolfe. Elyet was a longtime glass burner with Smith Glass Company in Mount Pleasant, a position from which he eventually retired. They were charter members of the First Evangelical United Brethren Church of Scottdale, and Elyet belonged to the Modern Woodmen of America Lodge. Sadly, Anna died in 1958. Elyet spent his final years in their home at 206 Mulberry Street in Scottdale. He died at home on Nov. 24, 1961. Burial was in Alverton Cemetery, officiated by Rev. James D. Mowrey. An obituary was printed in the Connellsville Daily Courier. Step-grandson Harvey Leasure made his home in the 1950s in Niles, Trumbull County, OH. Granddaughter Lottie Leasure ( ? - ? ) married (?) Bradley. They produced four sons -- Victor L. Bradley Sr., Torrance Bradley, Walter Bradley and Berle Bradley. During World War II, son Victor served in the U.S. Armed Forces. In the late 1950s, her residence was in Cleveland, OH. By 1961, she had remarried to (?) Hull and was back in Pennsylvania, living at 28 Forbes Street in Uniontown, Fayette County. Grandson Torrance V. Leasure (1891-1962) was born on Sept. 7, 1891 in Alverton, Westmoreland County. He married Helen Hostetler ( ? - ? ), daughter of Joseph P. and Elizabeth (Bungard) Hostetler of Saltlick Township, Fayette County. The couple produced four children -- Torrance V. Leasure Jr., June Ward, Genevieve Morgan and Beatrice Dragoo. The family dwelled in Connellsville and then in 1937 took possession of a small farm along the Connellsville-Mount Pleasant Road (known as "Cross Roads") in Pennsville, north of Connellsville. When Helen's father died in 1944, funeral services were held in the Leasure home. They were members of the Alverton Church of God but attended the Pennsville Baptist Church. Early in his working career, Torrance labored for American Sheet and Tin Plate Company in Scottdale and the Railways Steel Spring Company in Latrobe. Later, he joined West Penn Railways and in July 1921 was transferred to the Connellsville Division as a motorman. He completed his 25th year with the company in 1946. An article about the anniversary, published in the Connellsville Daily Courier, reported that "During most of this time he has worked runs on the main line between Uniontown and Greensburg.... During his service he has seen the conversion from two-man to one-man trolley operations. He is well known on the system, as evidenced by hearty greetings which he receives from his passengers.... [His] particular hobby is tinkering about his farm and home." He retired from West Penn in 1952. Interested in community affairs, he served for 12 straight terms on the Bullskin Township School Board and in the early 1960s was part of an effort to construct a new township elementary school. Among 150 kinfolk attending the reunion of Helen's Hostetler family at Maple Grove Park in August 1950, he was elected president and served with vice president Clyde Hostetler, secretary Lottie Solomon and treasure Clayton Hostetler. Torrance passed away on June 5, 1962, and was laid to well-deserved rest in Alverton Cemetery, with funeral services conducted by Rev. William Rodahaver and Rev. Joseph Harshman. Granddaughter Hazel Leasure was united in wedlock with (?) McKissock. Her home in 1957-1961 was in Greensburg, Westmoreland County. Grandson Chester Arthur Leasure (1895-1957) was born in July 1895 at Alverton and was named for the President of the United States. He married Ethel Crise ( ? - ? ) and had four sons -- Chester W. Leasure, Edgar F. Leasure, George M. Leasure and Ernest R. Leasure. For 37 years, Chester was employed as a West Penn trolley car operator. After leaving West Penn, he earned a living with the Fayette Coach Company and belonged to the Bus Operators Union. He also was a member of the Greenwood United Methodist Church and Connellsville lodge of the Masons. In 1957, their home was at 1110 Sampson Street in Connellsville. He died at the age of 62 in Connellsville State Hospital on Oct. 21, 1957. Burial was in Barren Run Cemetery, with Rev. Blossom M. Lenhart in charge. An obituary in the Connellsville Daily Courier said his survivors included 14 grandchildren and one great-grandchild. Son Edward Kenney (1870- ? ) was born in 1870 in Fayette County, PA. He is said to have died young. Daughter Mary Kenney (1872- ? ) was born in 1872 in Fayette County. Daughter Elizabeth Daisy "Lizzie" Kenney (1875- ? ) was born in 1875 near Loudenville, near Cameron, Marshall County or in Fayette County, PA. Her nearly six decades of life up until the 1930s are not known. Sometime in the 1930s, when she was in her late 50s or early 60s, Daisy was united in marriage with widower Frederick Felgar (1872-1955), son of Jacob and Rachel (Keister) Felgar, sometimes spelled "Folger" and "Fealgar." Born in Scottdale, Fayette County, Frederick was a longtime heater in a tin mill, and previously had been married to Elizabeth (1875- ? ). In 1935, he dwelled in Monessen, Westmoreland County, while Daisy that year lived in Somerset County. After marriage, they boarded circa 1940 with Daisy's unmarried cousin George Washington Hartzell in Loudenville. Daisy was mentioned in a 1944 Connellsville Daily Courier obituary of her sister Amanda Leasure. Suffering from prostate cancer, Fred died at home just a few weeks before his 83rd birthday on March 1, 1955. Burial was in Cameron Cemetery. Daisy signed the official West Virginia death certificate. Her fate is not yet known. Daughter Eleanor (or "Ella" or "Helen") Kenney (1876 - ? ) was born in 1876 in Fayette County, PA. She married Lloyd Ehart ( ? - ? ), possibly spelled "Gearhart." They made their home in Columbus, Franklin County, OH in 1944. Daughter May Belle Kenney (1880- ? ) was born in 1880 in Perry Township, Fayette County. Son John Francis "Frank" Hartzell (1849- ? ) was born in 1849 in Marshall County, VA. He married Mary Bogart ( ? - ? ) (also spelled "Bocher" in family papers). They dwelled in Cameron. Among their children were Alvin John Hartzell and Lynn Hartzell. Wrote Marlyn (Hartzell) Dalsimer in her family history, "After Frank's death, his widow remarried and moved to Sebring, [Mahoning County,] Ohio, where the family is believed to live still." Their paper trail has gone cold. Son Alvin John Hartzell (1882-1943) was born on Nov. 17, 1882 (or 1878) in Cameron or in Boston, MA. On his marriage license application, in 1906, Alvin stated his birthplace as "Boston, Mass.," although all other records show his place of birth as West Virginia. When he was 22 years of age, he boarded in the home of Emeline Hamilton in East Liverpool, Columbiana County, OH, and worked at one of the local potteries beside the Ohio River. He apparently was twice married. His first bride was Margaret Wheatley (1882- ? ), daughter of John and Susan (Wellborn) Wheatley of Salineville, OH. Fr. D.M. Smyth, of the Catholic Church in East Liverpool, officiated at the ceremony held on Oct. 4, 1906. At the time, Alvin lived in East Liverpool and worked as a potter, while Margaret, age 19, handled "transfers in pottery." Alvin's second wife was Gladys Plant (1901- ? ). They made their residence in East Liverpool, where Frank worked as a pottery caster. Their home was at 828 Bradshaw Avenue. At the age of 50, Frank suffered a heart attack and died four hours later on July 25, 1943. Burial was in Riverview Cemetery. Son Lynn Hartzell ( ? - ? ) -- was his actual name "Llewellyn"?